It’s time for a digital diet break! 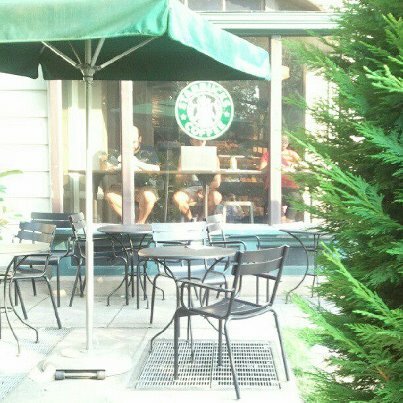 In order to finish my Digital Sisterhood book for my publisher, I need to go offline and focus (will be spending more time at local Starbucks and my kitchen to write!). My blog will be very quiet during July, August, September, and October. I will post about my BlogHer adventures in August, Blogalicious experiences in September, and Digital Undivided moments in October. I should be back in full force by November and definitely by December (for Digital Sisterhood Month). FYI – I will still post my weekly Obama tweets on my @anandaleeke Twitter account and Facebook posts to support President Obama’s campaign once or twice per week. Thanks to Hootsuite I will be able to schedule these posts in advance. Also, you can read my weekly Digital Sisterhood Network blog posts featuring Digital Sister Leaders and follow the #DigitalSisterhood Wednesday tweets. Did you know National Internet Safety Month is observed in June? This year the National Cyber Security Alliance (NCSA), a non-profit public-private partnership focused on cybersecurity awareness and education for all digital citizens, launched a “STOP. THINK. CONNECT.” campaign to encourage Internet users to slow down, be mindful, and think about how they interact and communicate with others online. NCSA’s campaign also encourages adults to teach a young person about better online safety so that they use good judgment and behavior in their digital life. When I first learned about NCSA’s “STOP. THINK. CONNECT.” campaign, I thought about the digital footprint of my fabulous and creative niece who is a digital native, a recent high school graduate, and a soon-to-be college “fresh-woman.” I wondered what she knew about being safe online and protecting her digital footprint. So I called and chatted with her about the importance of being safe online, making smart choices on what she posts online, and promoting a positive self-image in her digital life. I also told her that I would continue to check in with her throughout her college experience to make sure she is managing her digital activities in a responsible manner. 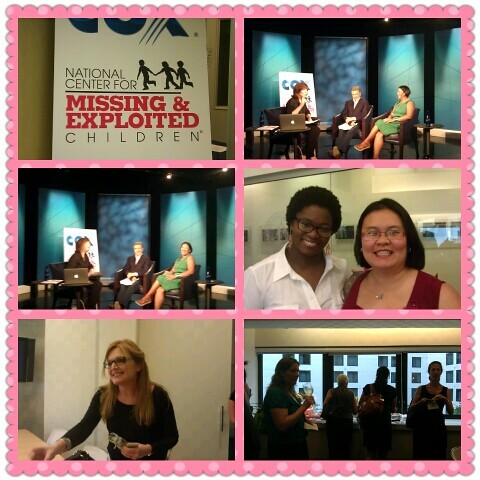 After my conversation with my niece, I decided to attend Cox Communications’ Internet Safety Discussion featuring America’s Most Wanted John Walsh and Leticia Barr, a family internet safety and security expert, social media consultant, and founder of TechSavvyMama.com (one of my favorite digital sisters — she is the green dress in the photos contained above) on June 28 at the National Press Club in Washington, D.C. During the discussion, I learned several tips I plan to pass on to several friends with children (some are my nieces and nephews). •95% of tweens use mobile devices. Only 20% parents enforce controls (we gotta do better). •Caretakers (grandparents, aunts, uncles, babysitters etc) should know about and enforce the parents’ Internet safety rules when they are taking care of the children. •The United States does not have a national standard for teaching online safety in schools (we need to advocate for one). •Children are not immune from identity theft (we have to do a lot of educating with children on these matters). •Parent should model what they want for their children when it comes to technology (so should extended family members who spend time with the children). •Common Sense Media rates apps for age appropriateness (great tool for parents to use in helping children use technology responsibly): www.commonsensemedia.org. To learn more about the discussion, go to Twitter and search for the hashtag #coxtakecharge. •Congratulate Leticia @techsavvymama! She rocked the discussion and looked stunning in her Land’s End green dress and sandals! •Reconnect with the Everywhere team Danica Kombol @danicakombol and Kelly Heisler @kellyheaisleratl. •Take photos with America’s Most Wanted John Walsh @johnwalshamw. 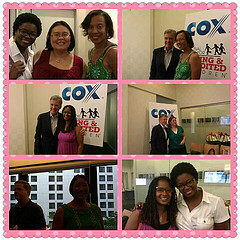 •Chat with Stephanie Davis of Cox Communications @Cox_Comm. •Meet and learn about digital sister bloggers including @Stimey, @Delora, Kellie Geres @dcnanny, Andrea Khoury @novahousewives, and Micaela @supernovamommy1 (and many more fabulous women!). •Hang out with some of my favorite “Blogalicious” digital sisters such as Xina Eiland @xeiland, Thien Kim @thienkim, and Eva @socamomdc. All in all I had a wonderful time learning, sharing, and connecting with new and old digital friends! PS: How do you stay safe online? Share your thoughts in the comment section below. It’s 100 degrees in Washington, D.C. today. It’s HOT like burning fire! Here’s the good news. The weather matches how I feel inside. I am fired up about President Obama’s successful re-election campaign. I am totally in!!! Are you? Here’s what happened to me this week. I had a chance to read President Obama’s commencement speech given on May 14 at Barnard College. The advice he gave to the graduates was exactly what I needed to read … inspiring and encouraging! See below. Click here to read his entire speech. If you have 30 minutes, click here to watch a video of his speech on the White House YouTube Channel. President Obama’s advice reminded me of the reasons I decided to volunteer my time to actively support the his 2012 campaign. Last weekend I participated in voter outreach by engaging my neighbors in conversations about how to register to vote and support President Obama’s re-election campaign as I walked up and down the streets of my U Street neighborhood with a bright smile and an Obama/Biden button, sticker, and sign. This weekend I am wearing that same smile with my pink Women for Obama t-shirt as I teach a kind and gentle yoga class in Malcolm X – Meridian Hill Park in Washington, D.C. on Sunday morning. If you are in the area, come out and join me. Click here for more details. At the end of the class, I will invite folks to show their gratitude by making a donation of their choice to the Obama 2012 campaign (online or by giving me a donation that I can submit online). If you are not able to attend the class, please visit BarackObama.com and make a donation. Thanks in advance! 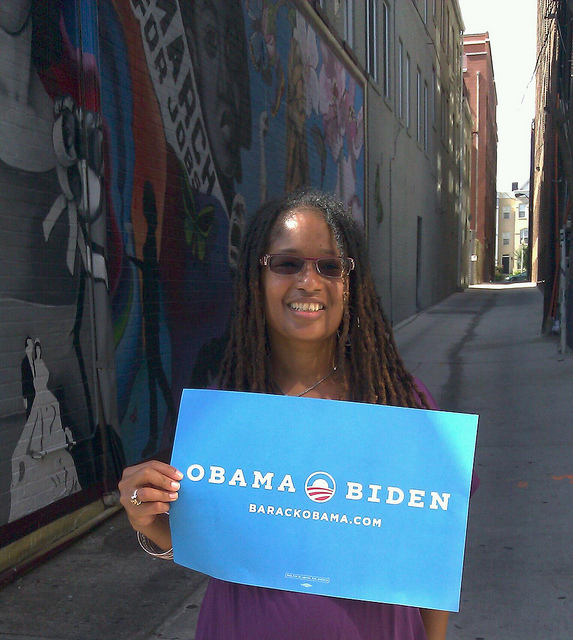 How are you supporting President Obama’s successful re-election campaign? Share your comments below. 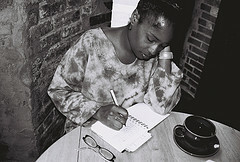 Today BeBlogalicious.com posted an excerpt from my forthcoming memoir, Digital Sisterhood: Fierce Living Online for 25 Years (late fall 2012). 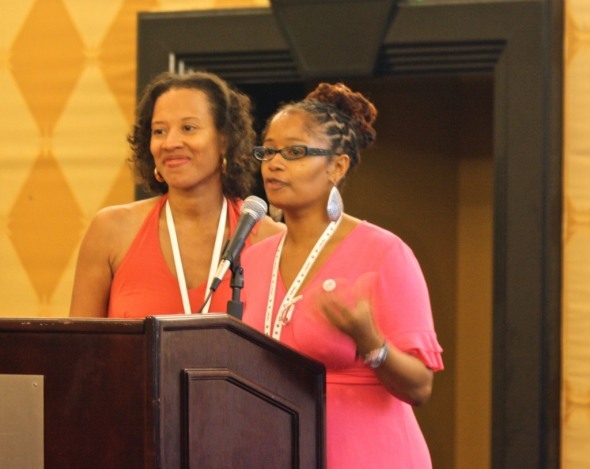 My excerpt discusses how Blogalicious gave birth to my Digital Sisterhood bond with PR and communications professional Xina Eiland. Click here to read it. Let me know what you think in the comment section below. Calling all DC, Maryland, and Virginia folks! Join me and my Kind and Gentle Yoga Meet Up Group for Sunday morning yoga from 9:00 a.m. to 9:30 a.m on June 24, July 29, August 26, September 9, October 14, and November 4 in Malcolm X/Meridian Hill Park located at 16th Street and Florida Avenue, NW Streets in Washington, DC. The U Street Metro on the Green Line is the closest subway stop. To stay updated on the class schedule, please click here to join the Meet Up Group (free to join). You can also find information about the classes on BarackObama.com’s event listiings. 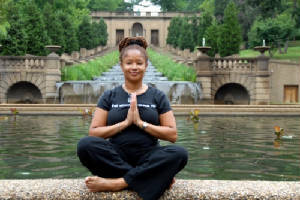 The yoga class will take place by the reflecting pool (with ducks and flowers) and waterfall located near the Malcolm X/Meridian Hill Park entrance at 16th Street and Florida Avenue (at the bottom of the hill). The yoga class is offered free of charge with an invitation for class members to make a donation to President Barack H. Obama’s successful 2012 re-election campaign online through the donation button on BarackObama.com: https://contribute.barackobama.com/donation/index.html. You can also make a donation offline by giving me your donation before or after the class. I will submit all yoga class donations online as a part of my OBAMA 2012 campaign fundraising efforts. PLEASE BRING YOUR OWN MAT. Mats are NOT provided. Try not to eat or drink 1 hour before the class. If it rains, the group will not meet. Email kiamshaleeke@yahoo.com if you have questions. I will be wearing a pink OBAMA 2012 t-shirt at each class. See photo below. Today is #DigitalSisterhood Wednesday on Twitter. 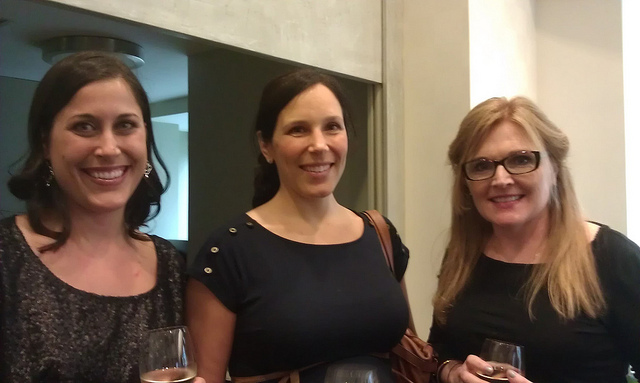 It’s a weekly celebration that I host to honor women in social media. It always energizes me and leaves me feeling proud to be a woman who uses her digital voice to honor, connect with, and build community with a diverse group of social media women. Many of these women keep me informed, inspired, and encouraged. Last week was a hard one. I had difficulty watching and reading the attacks against President Barack H. Obama. I took it personal. I let it all get to me. 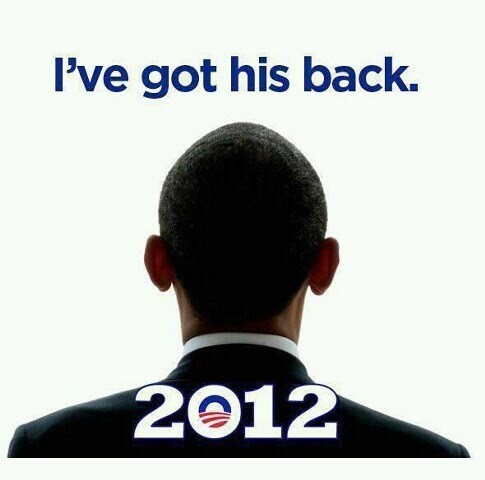 I started doubting my power to affirm and support the successful 2012 re-election of President Obama. My attitude shifted when I started reading the Twitterstream of Dr. Goddess and Zerlinda Maxwell on Saturday, June 9. They were live tweeting from the Netroots Nation annual conference. One of Zerlinda’s tweets included a link to President Obama’s video message to the Netroots Nation attendees. Click here to watch it. 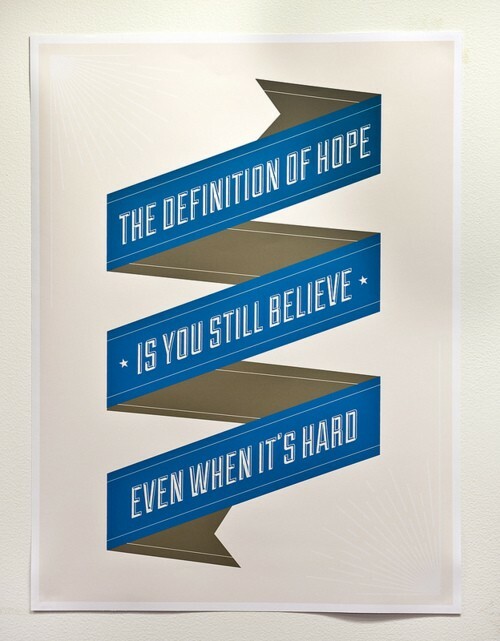 After watching President Obama, I started to feel hopeful. My day got better when I went to run errands in my neighborhood and met two sistafriends who gave me a mouthful of reasons why they were stepping up their support for President Obama. I came home and wrote my mission statement and a list of the ways I will support President Obama’s successful re-election campaign. See below. Investing in the Obama campaign financially each month to demonstrate my commitment to President Obama and to take ownership of the counrty I choose to live in as an American citizen. Talk to people I meet about registering to vote and share the great things the Obama Administration has done to improve the United States since 2009. Talk to my father “J” about his digital activism in support of President Obama each week. Why? J stays on top of all things Obama. He uses his Facebook, Twitter, and email accounts to keep his network informed about the Obama Administration’s great works. 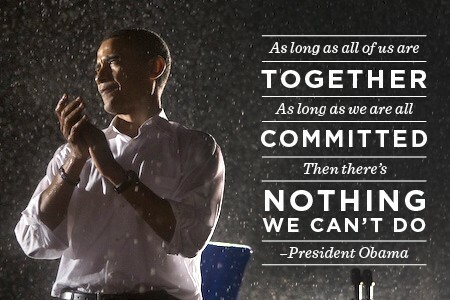 His positive attitude and unwavering commitment to President Obama keep me uplifted. (STARTED ON MONDAY). Check out my first week’s post about some of the great things President Obama and his team have done to improve the lives of women and girls. Most of my posts will focus on women and girls (so get ready!). 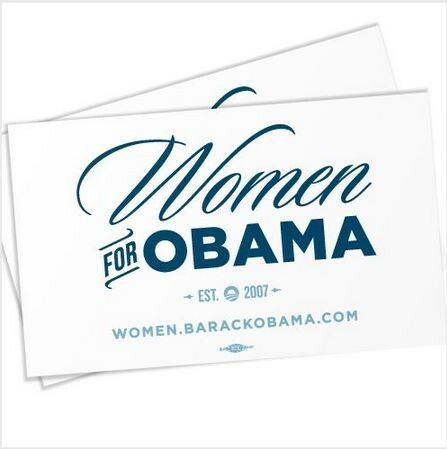 FYI — I read about the efforts on the WhiteHouse.gov’s Council on Women and Girls’ page. I also subscribed to the email updates. It makes it easier to stay updated (have been receiving them since the Council was created). 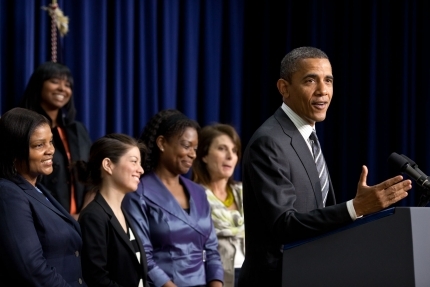 In April, the Obama Administration hosted the White House Forum on Women and the Economy and released a report that outlines a wide range of policies, programs, and initiatives that support women and girls at all stages of their lives. Nearly 200 women participated in a conversation about the critical role women play in driving U.S. economic progress. Click here for more details. WOMEN POWER ROCKS! The White House released the Girls in STEM video and took it on the road with support from some of the Nation’s top women scientists and engineers in April. The video urges girls to open their minds to careers in these fields. In May, President Obama added a historic focus on women’s rights at theG-8 and NATO Summits. THAT HELPS WOMEN AND GIRLS AROUND THE GLOBE TOO! Associate Director of Digital Content for the Office of Digital Strategy at the White House, wrote a WhiteHouse.gov blog post that reported more than 20.4 million women with private health insurance received preventive health services at no additional cost due to President Obama’s health reform law which requires new health insurance plans to cover preventive services such as mammograms, pap smears, and well-woman visits with no co-pay or deductible. FANTASTIC NEWS! Valerie Jarrett, Senior Advisor to President Obama and Chair of the White House Council on Women and Girls, published a WhiteHouse.gov blog post that discussed how women entrepreneurs are creating jobs in June. It includes an interactive timeline with profiles of different women entrepreneurs. I discovered Yes! Organic Markets owner Kathy Rachel is featured in the timeline. I shop at Yes! two to three times per week in my D.C. neighborhood. I’ve been supporting this woman-owned business since 1992. GO WOMEN ENTREPRENEURS! 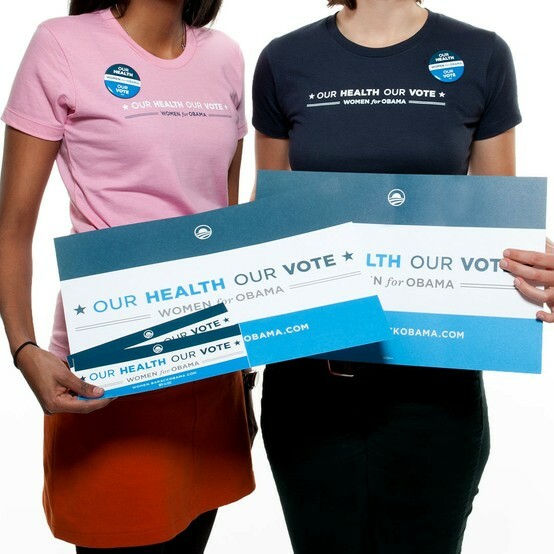 If you are on TEAM OBAMA, how are you supporting President Obama’s 2012 re-election campaign? Share your comments below. Happy June! What’s happening with Ananda all month long …. Happy June and Happy Tuesday! 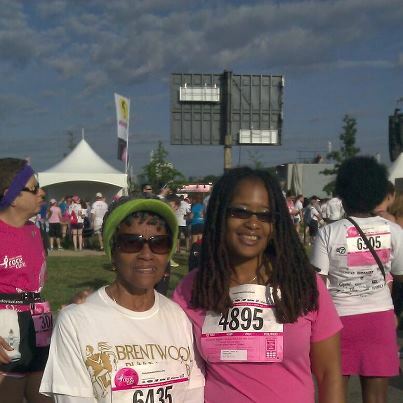 Today I am marinating on the wisdom I received from Ms. Delores, a 79 year old runner. 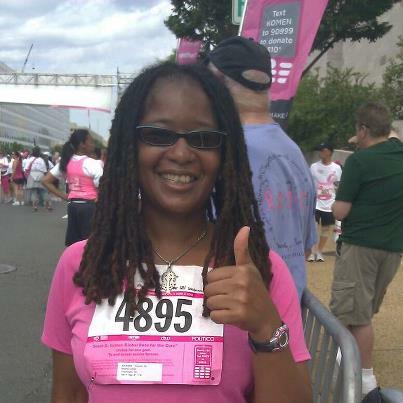 I met her while running the Komen Race for the Global Cure 5K on June 2 in DC (see photo). She started running at the age of 50 and currently leads a running group in her neighborhood. Her wisdom was rooted in moving your body, moving your mind, and moving your spirit. They all work together for your highest and greatest good. How are you moving your body, mind, and spirit this month? I am moving my body with daily yoga and walking, weekly running and core/weight training exercises, healthy eating, more sleep, weekly biking, and a 5K on June 16 for pancreatic cancer. I am moving my mind with a daily writing schedule (it’s a fierce bootcamp that is getting me through the final chapters of my Digital Sisterhood memoir book). I am also moving my mind by reviewing my vision board book that I had to make as part of my Mastermind Group on a daily basis. 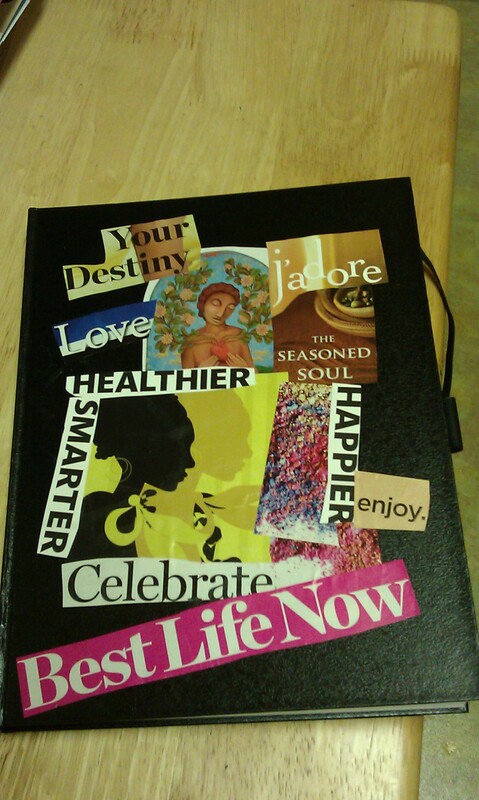 It is filled with positive affirmations, goals, and mini vision boards that support all parts of my life. I am moving my spirit with daily prayer, meditation, Reiki healing touch, and devotional reading. I am also making sure that I attend my Mastermind Group weekly meetings, People of Color Sangha Buddhist monthly meeting, and weekly church service at All Souls Unitarian Church. Enjoy June!